Fresh delight! Take the best Northwest organic ingredients, grow them locally then creatively mix them with ethnic influences, and voila, you have culinary magic! Mizuna artfully prepares a seasonal menu with the best tasting fruits and vegetables complemented by free range chicken, naturally grown beef and fish so fresh that it must have just come from a river in the back room! Vegetarian and vegan entrees are tastefully prepared and presented with style. Whether its lunch or dinner, each meal HAS to end with one of the fresh daily deserts! An impressive Northwest wine list and a full bar with new versions of old favorites, completes the culinary picture. 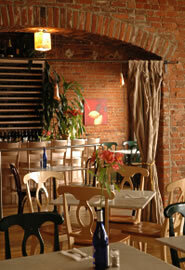 The ambience of the old brick bistro atmosphere lends an enchanting setting to enjoy great fresh food. 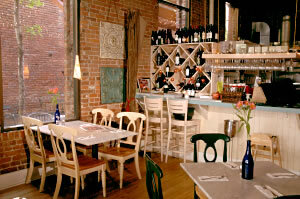 Kudos to chef Brian Hutchins…this is one of Spokane's favorite restaurants. 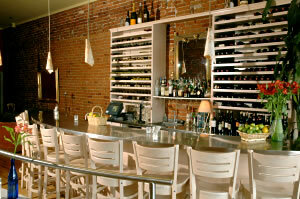 Wine Bar: Open until midnight with a late night menu and full bar on weekend evenings. with live music on weekends.